Kraftwerk …the influential electronic music project formed in Dusseldorf, Germany. The signature Kraftwerk sound combines driving, repetitive rhythms with catchy melodies, mainly following a Western Classical style of harmony, with a minimalistic and strictly electronic instrumentation. The group’s simplified lyrics are at times sung through a vocoder or generated by computer speech software. 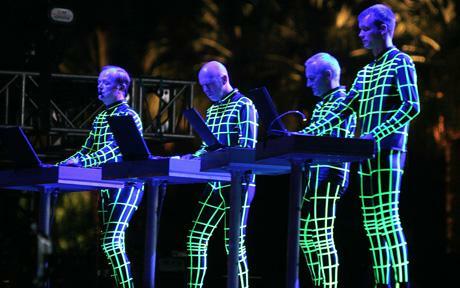 Kraftwerk were one of the first groups to popularize electronic music and are considered pineers in the field. In the 1970s and early 1980s, Kraftwerk’s distinctive sound was revolutionary, and has had a lasting effect across many genres of modern music. So are you one of those Kraftwerk addicts? Then be sure to tune in to this 72 minute mix of all the greatest Kraftwerk tracks. With thanks to Tim Zawada for sharing this mix. I would very much like you to produce another version of Yazoo – Situation. Hi Marceltapi. Do you mean you would like another version in the request database? Yes, I would. I think a shorter version would be much more appropriate. Please..can somebody help…i wish playlist of this mix= “de mist in met ab 28 – sandra`s choice 7 – The Friday Evening Show ” = can somebody help me?!!! thank you very much!!! and “Pax Vobiscum”!! !